This recipe for warm Whole Wheat Amish Friendship Bread Rolls was shared with us by Kitchen Friend Melody O’Banion and goes perfectly with a pot of soup. If this bread is too sweet for your taste, you can half the amount of sugar added to day six and day ten when making your starter. It will not affect the baking of the bread, just make it less sweet. You can also freeze one cup of starter on day ten then take it out, thaw it, and bake with it whenever you need it. 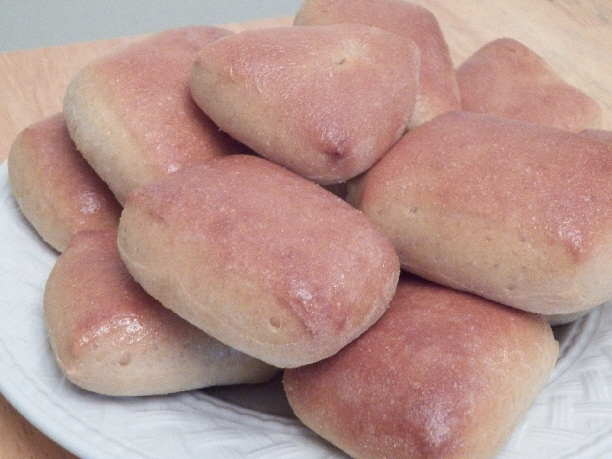 This recipe for warm Whole Wheat Amish Friendship Bread Rolls goes perfectly with a pot of soup! On a floured surface, knead each ball. After kneading each ball, pat out until about ½" thick. Use pizza cutter to cut out in rectangular shapes and place on greased cookie sheet to continue the rise. These rolls are soooo good!! I used half whole wheat flour and half bread flour. I will definitely make these again and again and again! If you were going to freeze these, how does that work? Do you form them and then freeze them? Bake them half way? Bake them all the way and then freeze? I tried forming them and freezing them unbaked and they did not turn out well once thawed. I’m going to try half baking next.